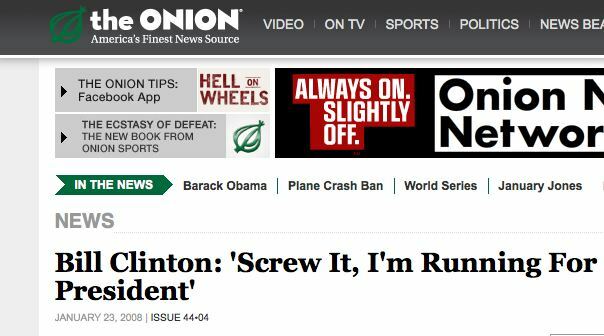 It’s long been known that the creative team behind The Onion is comprised primarily of fortunetellers, time travelers, palm-readers, and other folks who are capable of peering deep into the future. Remember the article on how George W. Bush revived war, jingoism, recession, fear, and loathing…published in January 2001? How about when they prophesied the advent of Joe the Plumber all the way back in 1993? Or that Gillette would be crazy enough to put five blades on a razor (three years before the product was even introduced)? And how about that tiff between an Al Qaeda spokesman and 9/11 Truthers? Oh, look, here we are in November 2011, and…..
On Tuesday, the 42nd President of the United States appeared on MSNBC’s “Morning Joe” to discuss, among other things, his take on the two-term limit. The thought of scrapping the Twenty-Second Amendment and paving the way for another coming of Clinton would surely speak to the desires of Americans who pine for an era when unemployment was at 4 percent and the commander-in-chief played tenor sax on MTV. Okay, so maybe he wasn’t explicitly applying “the rule” to himself, or declaring another presidential bid. But that doesn’t change the fact that the Onion news team clearly time-travels to land scoops on things like the Iraq War and safety razors.